Rebecca Lucario is known for her delicate and intricately painted pottery. She uses traditional Acoma clay and paints with bee-weed (a plant) and clay slips. Ever since one of her plates appeared on the cover the “Changing Hands” exhibition catalog, her work has become iconic with fine-line style painting. This larger plate has a fineline center design. This emanates out into the “petals” of the flower which are a series of diamond shaped patterns. They are either filled in black, painted with fine-lines or painted with and outlined “x” design. The design starts small but gets larger as it nears the rim. The rim of the jar is painted with a red clay slip. 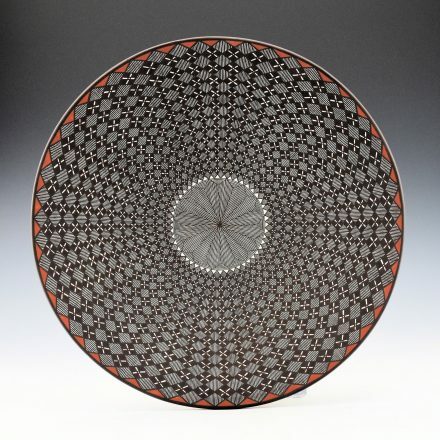 The intricate design of the plate is certainly visually dynamic! It is signed on the back, “R. Lucario, Acoma, 2018”.